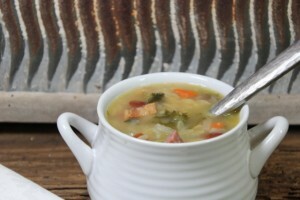 I was in the mood for soup on Thursday, and found this recipe on my favorite go-to recipe site, Cook’s Illustrated. I did change quite a bit from the original recipe, but it was a great launching pad for recipe creativity. I’m not a big cabbage fan, so I substituted kale instead and doubled the called for carrots and celery. 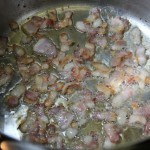 I also wanted to make it more of a meal, so in addition to increasing the bacon slightly, I also added 8 oz. 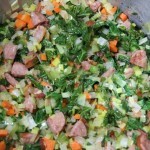 of chopped kielbasa to the soup. And I don’t care what anybody says about flavor; I think that gelatinous juice that canned beans are in is nasty. I rinsed and drained mine before adding to the soup. 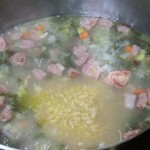 I was afraid that the soup wouldn’t have enough flavor with just using water as the base, so I eliminated some of the water and substituted 26 oz. of chicken broth instead. I wasn’t sure what to think of the cinnamon called for, but I used it. I can’t say I tasted it, but you’re free to use it or eliminate it. 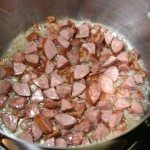 Although the original recipe called for only white pepper, I also added about ½ teaspoon of freshly ground black pepper. Serves 6 to 8 as a main course. Original recipe from Cook’s Illustrated, published September 1, 1999. 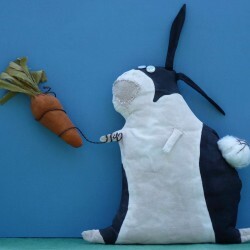 Recipe altered significantly by Crafty Farm Girl, January 2012. Don’t grate your potato until just ready to add it to the soup or it will discolor quickly. Adding the pasta to the pot last, when just about ready to serve, helps it hold onto its bite. 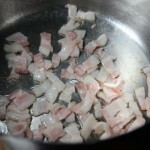 Brown the bacon in the olive oil in a large soup kettle or stockpot over medium heat. 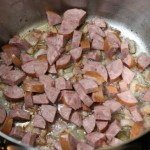 When it’s beginning to get brown add the sliced and quartered kielbasa and continue to cook, stirring frequently until the bacon has finished cooking and the kielbasa is a bit browned. 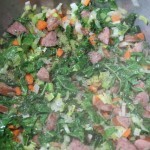 To that same pot add the chopped kale, onion, leeks, carrots and celery and sauté until softened, about 5 minutes, stirring a few times as you sauté . 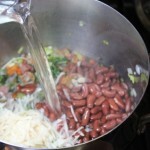 Add reserved potato, beans, peppers, salt, cinnamon, 1 quart hot water and 26 oz. 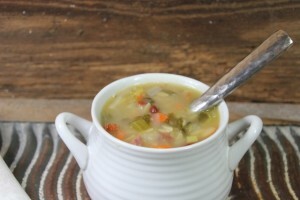 chicken broth; bring to boil, reduce heat, and simmer about 5 minutes to meld flavors. 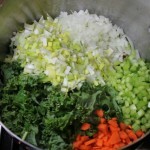 Add orzo, reduce heat to low, and simmer until orzo is tender, 7 to 8 minutes. 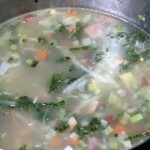 If you find soup is too thick, you can thin it with additional chicken stock or water. 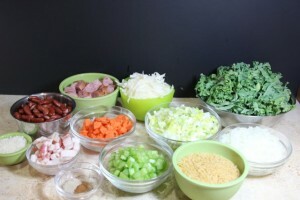 Adjust seasoning with additional salt, if necessary, and serve, passing grated cheese separately. This looks DELISH. And perfect for the cold weather… love all of the colors.